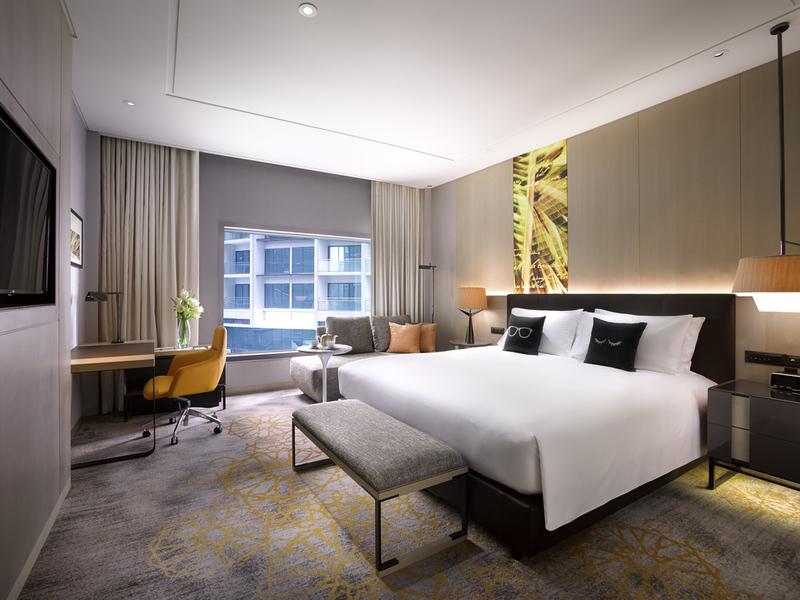 From soaring skyscrapers and minarets to botanical gardens, museums and ultramodern malls, there is so much to see in Kuala Lumpur and the surrounding Klang Valley, and no better place from which to discover it all than Sofitel Kuala Lumpur Damansara. The hotel enjoys a prime location in Damansara City, or DC, a new urban development created for convenience, leisure and productivity. In the exclusive Damansara Heights enclave, you are a short walk from the MRT station, mall and office buildings. After a day of meetings or urban exploration, come back to the hotel for a delicious meal at one of our restaurants and drinks at the bar. Chinese, French or Mediterranean. Cocktails, Champagne or craft beers. The choice is endless and always enticing. Enjoy being pampered in our luxury SoSPA. The hotel also features a sauna and hammam for some steam therapy. You can stay in shape during your holiday in Kuala Lumpur at SoFIT, our state-of-the-art gym, or relax and refresh by the outdoor swimming pool. 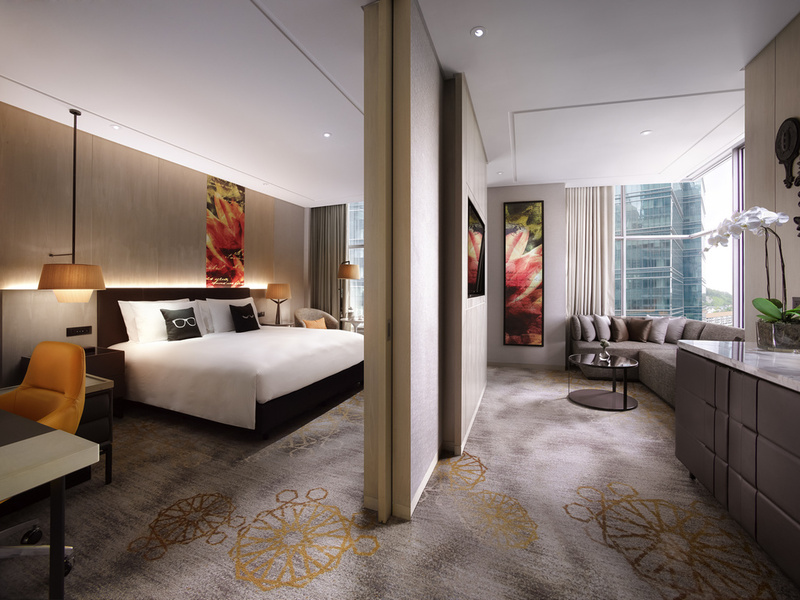 Welcome to a world of refinement and 5-star luxury at Sofitel Kuala Lumpur Damansara. French elegance and Malaysian tradition permeate the hotel, from the uplifting design and impeccable service to the superb dishes served at our restaurants. Life is Magnifique in Kuala Lumpur..
Each Sofitel is a unique blend of the French art de vivre and local refinement. 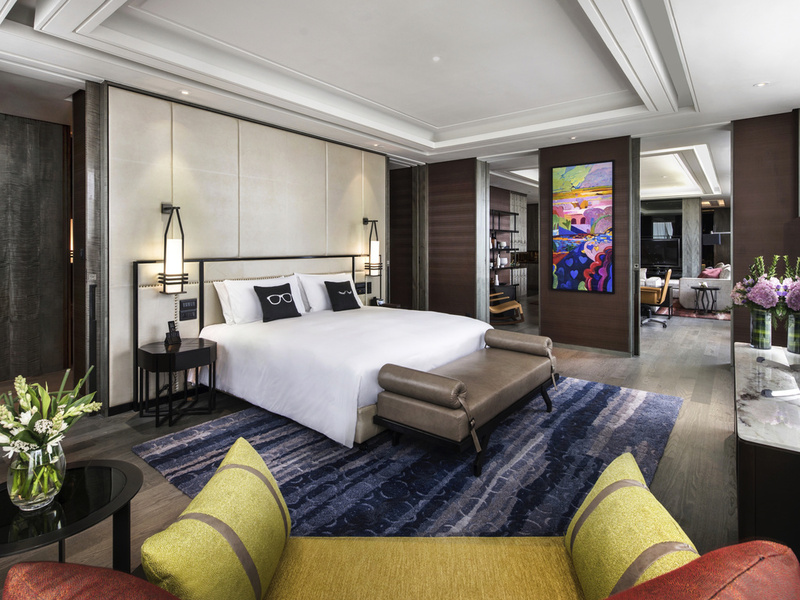 Sofitel Kuala Lumpur Damansara celebrates the diversity of Malaysia and France - blending French sophistication with Malaysia's melting pot of cultural influences. Malaysia's multi-ethnic heritage - a unique mix of Malay, Indian and Chinese cultures - is present throughout the hotel. From the restaurants to the lobby and luxury spa, hibiscus motifs adorn the hallways and Batik prints embellish uniforms. French elegance underscores the Malaysian spirit at Sofitel Kuala Lumpur Damansara. From the fittings and floral arrangements to the fresh-baked pâtisseries and wine tastings, French flair and savoir faire surround you. Experience luxury and convenience in Damansara, an exclusive area to call home during your stay in Kuala Lumpur. The nearby MRT station connects you to everywhere you need to be in the metropolis and the surrounding Klang Valley. Discover the true definition of 5-star luxury in our spacious and elegant rooms. Timeless design blends French sophistication and Malaysian tradition, creating a serene setting for rest and relaxation at the heart of Damansara City. Plush furnishings, including a chaise longue and the iconic Sofitel MyBed, invite you to put your feet up and enjoy all the modern amenities. The large bathroom provides plenty of room for luxuriating with our exclusive French toiletries. Our suites range from vast to palatial, for superlative space and comfort during your stay with us in Kuala Lumpur. Some feature separate living and dining areas; all enjoy magnificent city views and grant unlimited access to Club Millésime. A 43 SQM / 463 SQFT unique blend of French sophistication and contemporary design room, featuring Sofitel MyBed, generous bathroom with separate bathtub and shower, Lanvin bath amenities, WIFI access and 49 inch LCD TV. A 43 m² room with Club Millesime access featuring Sofitel Mybed, 49 inch LCD TV, generous bathroom with separate bathtub and shower, WIFI access and Lanvin amenities. 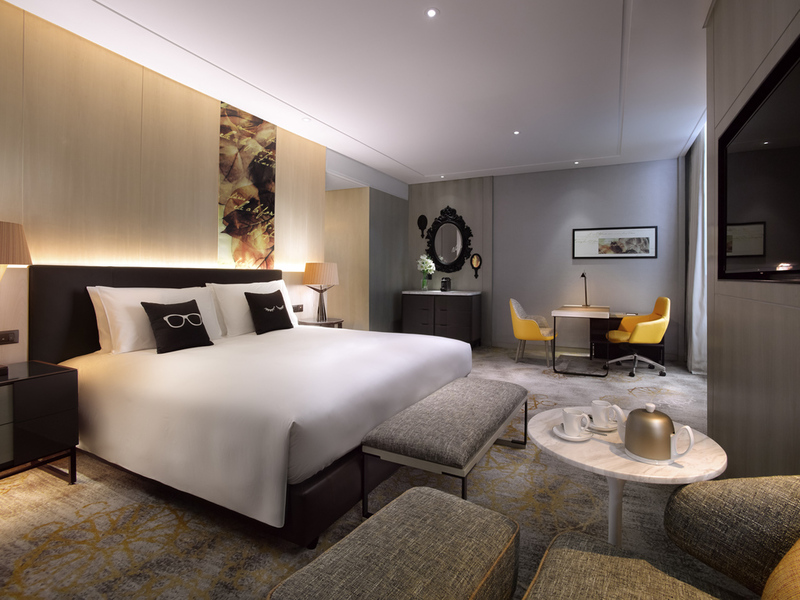 A 43 m² room with Club Millesime access featuring Sofitel Mybed, 49" LCD TV, generous bathroom with separate bathtub and shower, WIFI access and Lanvin amenities. A 55 m² unique blend of French sophistication and contemporary design room, featuring Sofitel Mybed, 49" LCD TV, generous bathroom with separate bathtub and shower, WIFI access and Lanvin amenities. A 60 m² room with Club Millesime access, separate lounge area, featuring Sofitel Mybed, 55 inch LCD TV, generous bathroom with separate bathtub and shower, WIFI access and Hermes amenities. A 105 m² room with Club Millesime access, separate lounge area and dining room, featuring Sofitel Mybed, 55 inch LCD TV, generous bathroom with separate bathtub and shower, WIFI access and Hermes amenities. A 187 m² room with Club Millesime access, living room, dining room and kitchnette, featuring Sofitel Mybed, 65 inch LCD TV, generous bathroom with separate bathtub and shower, WIFI access and Hermes amenities. If you are staying in a Club room or suite, join us at Club Millésime for some extra-special privileges. In a peaceful setting, high above the streets of Damansara, enjoy gourmet treats throughout the day with breakfast, afternoon tea and wine tastings. Our executive lounge also features a meeting room for your business needs. A selection of international newspapers and magazines, along with unlimited high-speed Internet access, keep you connected to the world outside. When you don't feel like leaving the heavenly comforts of your room or suite, our in-room dining service brings delicious dishes to your door. An enticing selection from our restaurants lets you choose whatever you are in the mood for, day and night. Dine in style during your stay in Kuala Lumpur at our refined Chinese restaurant, or take it easy with tapas at the poolside lounge. You can also enjoy innovative pan-Asian cuisine in our all-day restaurant or French delights at our Parisian-style café. Reap the benefits of Sofitel's renowned heartfelt service by joining us at Le Bar for casual drinks and snacks throughout the day. Or enjoy a taste of the French Riviera by heading to the pool deck for refreshing cocktails and relaxation under the sun. Make Sofitel Kuala Lumpur Damansara the venue for your next event in the city. With seven beautiful meeting rooms and a stunning ballroom, our luxury hotel is an outstanding setting for corporate events. For intimate board meetings, extravagant galas, business seminars or conferences, our event planners are always on hand to make sure everything goes smoothly - letting you concentrate on the business at hand. Take advantage of cutting-edge audiovisual equipment for flawless presentations, and our premium catering service for business meals to remember. Whatever you have in mind, we make your event in Kuala Lumpur a resounding success. Weddings are sumptuous affairs at Sofitel Kuala Lumpur Damansara and we enjoy nothing more than organizing them for you. Celebrate your special day with us to create magnifique memories to treasure for a lifetime. The bride and groom spend their first night of nuptial bliss in a Prestige suite bedecked for romance. We also offer two complimentary one-night stays for family members in Luxury rooms and special advantageous rates for the entire wedding party. Share with us your tastes and traditions and we will prepare an outstanding banquet. Indulge in one of three 9-course gourmet menus featuring Asian cuisine, or a refined 4-course Western menu. Test your meal beforehand with a group of 10 select guests. Your ceremony is tailored to you, for the wedding day of your dreams in Kuala Lumpur. Choose a Chinese theme with the Emperor Package, a Malay theme with the Royal Package or see life through rose-tinted glasses with the Western 'La Vie en Rose' package. Enjoy peace of mind in the days leading up to your big event knowing that our wedding planners have everything under control. From the décor and the catering to the stellar service, let us take care of the details while you spend time with your guests. Entering the Wau Bulan Ballroom is like stepping into a fairytale. This unique space, with its curved walls and spectacular ceiling, was designed with wedding celebrations in mind. As versatile as it is striking, our ballroom comfortably seats 500 guests. Your dream wedding venue in Kuala Lumpur is easily reached by air, rail and road. 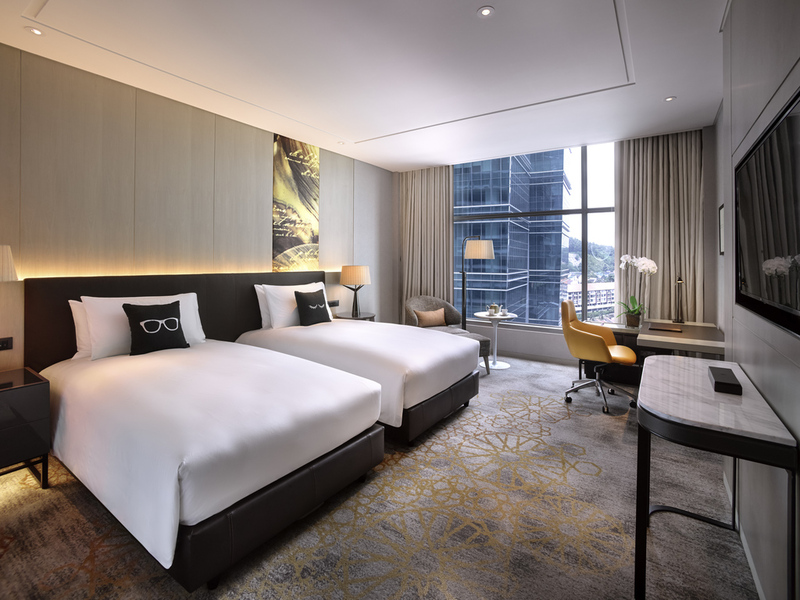 Strategically situated between Kuala Lumpur and Petaling Jaya, the 5-star hotel is right next to the new Damansara City MRT station, for added convenience. Prolong newlywed bliss and experience all the magic of Kuala Lumpur. What better way to continue your wedding celebrations than by staying for your honeymoon once your guests have gone home? For memories you can cherish together forever. SoSPA offers a unique hotel spa experience characterized by four key principles of socializing, intimacy, cosmetology and authenticity; through health and beauty treatments inspired by time-proven world traditions and refined French cosmetology. 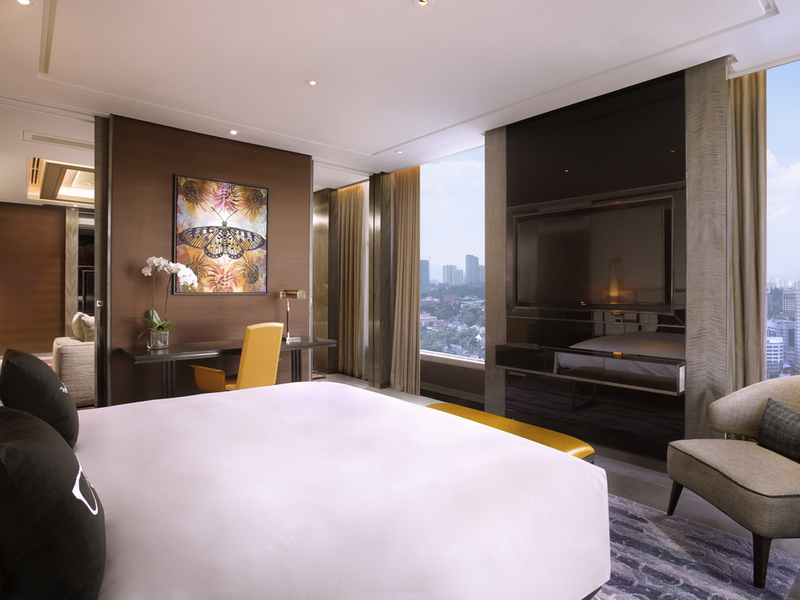 Sofitel Kuala Lumpur Damansara is more than just luxurious rooms and gourmet dining. A stay with us also brings you outstanding services, tailored to your needs and desires, along with state-of-the-art wellness and fitness facilities. Our concierge is always ready to assist you during your stay at Sofitel Kuala Lumpur Damansara. From what to see to where to eat, our local expert knows all there is to know about the city. Don't hesitate to make the most of his insider advice. Discover an urban oasis nestled amid the sparkling towers of Damansara City. Sip cocktails as the sun's rays dance across the limpid waters of the pool. No need to get up - Nizza brings tapas, salads, desserts and drinks directly to your sunlounger. Gaze out over views of the swimming pool as you stay in shape at SoFIT, our 24-hour fitness center. Improve cardio endurance with the latest Technogym machines or tone and strengthen with free weights under the guidance of a qualified personal trainer.